If you find that carving meat is too time consuming and tough to do correctly, you might want to consider using an electric knife. Instead of using muscle power, use motor power to carve up your Thanksgiving turkey, roast beef, chicken, vegetables and bread. The best electric carving knife can easily glide between bones to separate large chunks of meat and will give you even and smooth edged slices from those chunks. You have to be careful when handling an electric knife. Make sure that the blade is securely locked into its handle before using it. The best knives may also have a safety lock so that it doesn’t start when you’re not expecting it to. It’s important that the power cord is long enough that it doesn’t get in the way of your carving job and you have the right surface to work. Of course, you can get a cordless knife instead. A powerful knife is best because you don’t want it to overheat if you need to use it for long and tougher jobs like carving up a large turkey. If your primary need is to slice raw meats and vegetables and cheese often, you may prefer an electric food slicer. For filleting and boning raw fish in the kitchen or when out fishing, choose an electric fillet knife. Now with that advice out of the way, read through our electric carving knife reviews to see which of our picks will be most suited for your needs. If you’d like to research a few more products yourself, here’s a selection of electric carving knives from Amazon, rated 4 stars or more. If you are looking for the Cadillac of electric knives, look no further than the Cuisinart CEK-40. This beautifully designed knife is ergonomically crafted so that out of all the corded knives listed here, it will feel the best in your hand whether you’re right or left handed, which means it will be the easiest to use. Needless to say, for those larger carving chores, like say turkeys, smoked hams, roasts, the grip is going to make carving these meats a breeze. 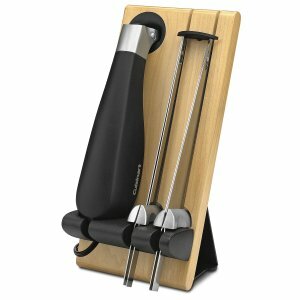 Most electric knives are made to be stored away when not in use, but the Cuisinart comes with a wooden display board which houses the knife and all of the accessories. Sure, you can store it in a cabinet or in a drawer, but this is the most beautiful presentation of an electric carving knife that actually warrants a place on your counter top. Included is the aforementioned wood block storage tray, two long term performance 8″ serrated twin blades, one of which is a carving blade and one is a bread blade, and the handle. The squeeze “on” trigger is light to the touch, so even though it has no locking “on” mechanism, you’ll never get tired of squeezing it on. The advantage of this type of switch is that you get more control as you’re doing the carving. With a traditional on or off, you have to stop and start in the middle of the job. Easy release buttons make inserting and removing the blades a breeze. There is also a safety lock that you engage before storing the knife away. Of course, don’t expect this to come inexpensively. This is the best looking and technically the best performing corded electric here, and those qualities make it the most expensive corded knife on this list. Better still, you know this is a high quality unit since it is backed by a Cuisinart 3 year limited warranty. Granted, it’s only an electric knife, but that type of warranty, for a product like this, is certainly good for some peace of mind with a design that will feel good in your hand every time you use it. The only negative that a few customers report is that the knife base is not designed to keep the knife standing when placed down in between using it. The NutriChef Electric Cutting & Carving Knife may not look like regular electric knife, but the mini vacuum type of grip design is very comfortable to using. This would be our pick if you don’t want to spend on the more expensive Cuisinart. The Nutrichef electric knife also comes with two sets of 8.9″ twin blades – one for carving meat or veggies and one for slicing bread. The squeeze trigger safety lock is positioned under the grip while the squeeze trigger button on the top is to start the knife. The button on the front is to release the blades. Each twin blade comes apart for easy cleaning. The cord is a bit on the short side, but not so short to limit you. There is no storage case included but there is a sleeve just for storage of the blades. Even though you can carve almost any food with this knife, make sure that you let it rest for every few minutes of work so as not to overheat the motor. At one of the lower priced options on the list, the Hamilton Beach Carve n’ Set Electric Knife is a good deal on its own. The knife comes with a case, making it easy to store in a large drawer or a cabinet, and included in this deal is a serving fork to help you cut and serve. The Hamilton Beach also comes with an ergonomically designed handle, but it may be a bit too large for smaller hands. Depending upon the user, it may not be the best day to day electric knife and you only get one 7.5″ blade, although using it once in a while for holiday roasts, ham and turkeys, shouldn’t be a problem. But the actual cutting function itself is first rate, and it will let you zip through meat or bread without a second thought. The “on” switch is made of rubber, so it is easy to grasp even if your fingers are wet. However, it does not feature a lock to keep the knife on and the squeeze trigger is not that easy to keep pressed for long durations. You certainly aren’t going to save the world using this knife, but for the price and occasional use, it won’t let you down. If you are looking for the lowest priced electric on this list then welcome to the MaxiMatic Elite Cuisine Electric Knife. With a 10″ blade, this electric knife has a bottom mounted squeeze button that you press when you are holding the knife in your hand. Release your grip and the knife will stop. Even though it has no locking function, the placement of the button makes it easy to activate although some customers say that people with small hands will find it hard to use. However, be aware that the top mounted button releases the blades. They are spring loaded, and if you accidentally press it, the blades will literally come out of the knife handle. This is a totally no-frills electric knife, but that also means that the price is right. Because it is so inexpensive, people have gotten it to cut things like matting and high density foam, and it actually does a credible job cutting those materials. Since it is priced so low, it can be easily replaced if it wears out. The reality is that if you just want an electric knife that is capable every which way you use it, you may pay more for another brand or take a chance with this one. If you want the most convenient to use electric, and price is no object, your only choice is the Waring Commercial Cordless Electric Carving Knife. At nearly 10 times the price of the least expensive knife, this is an electric for serious carving only, but it is lovely to handle and beautiful to use. It comes with a carving blade and a bread blade, and the case folds up easily for storage in a cabinet or a drawer. With no cords to worry about, you can slice and dice in any direction you need to be and from any angle without having to worry about a cord. The Lithium-Ion battery, with included charger, allows this knife to run continuously for about 20 minutes, which means you’ll have all the time needed to cut up the largest turkeys, roasts or hams, and even multiples if you are having a party. This is the most comfortable to use knife, bar none, with a balanced weight that makes carving a near effortless endeavor. Just a tip of the wrist, back and forth, is all you will need to cut slices as thin or as large as required. The locking safety feature means there’s no danger of accidentally turning it on, and it comes with an adjustable slice thickness guide so that your slices will be perfect every time. It even has an LED light just in case you’re carving something in a low light room.